washington fly fishing: November's Wild Moon. A pretty, late season, Yakima River rainbow trout. As I write this tonight I am sitting beneath the bright moon of November. Sometimes called the "Mourning moon", the "Beaver moon", or the "Frost Moon". I haven't seen any beavers around here lately. But it has been getting stormy, wet and wild, and frosty over the last few weeks. And this really is the harbinger of winter. We have just one month before the winter Solstice. But it already feels like winter to me. Our Olympic Peninsula rivers and forests have been getting plenty of rain, and some snow too. We can only mourn a little for autumn, as this is just what we needed. Today we also had howling winds out of the northeast, coming down the Fraser River Valley, blasting across the Strait of Juan de Fuca, blowing 30 to 40 knots, with gusts above 50 knots just north of here. More trees down, power outages, storm damages.We just narrowly escaped getting slammed with heavy rain and snow too. Just another November in the Pacific Northwest. Hoh River Closed. For now. Action: Close the Hoh River to fishing. Effective date: Nov. 24 through Nov. 30, 2015. Location: The Hoh River outside Olympic National Park. Reason for action: Wild coho in the Hoh River require additional protection. The daily limit was reduced preseason for these rivers in anticipation of a weak return of wild coho, but indicators are pointing to the run returning at a still lower level than forecast preseason. The Hoh Tribe has closed their fishery until the end of November, and in combination with this sport closure, these actions will result in additional wild coho spawning. Other information: The Hoh River will open back up for steelhead and other gamefish on Dec. 1, 2015. Information contact: Mike Gross, District 16 fish biologist, (360) 249-1210. Just as the rivers were coming back into good shape, and with the Thanksgiving weekend holiday upon us, Washington Dept. of Fish & Wildlife and the Hoh Tribe agreed to a closure on the Hoh River, to protect the tail end of the wild coho salmon run there. No one will be fishing on the Hoh River until it reopens in December.I am disappointed. I wanted to fish this week ahead. And even with no serious hatchery steelhead program on the river, we still get some good numbers of hatchery strain winter steelhead in the Hoh River every winter. They will be there in December too . . . And I am glad to see the effort to protect the coho salmon too. I have watched the weather carefully, and the next five or six days ahead look very good, for river flows, and fishing out on the Rainforest rivers. I had my heart set on spey casting on the upper Hoh. But that's alright. We still have miles of good water to fish on the other rivers. I'm going anyway. From now until January 1st I will be fishing for winter (hatchery run) steelhead on the rivers out here. Then I won't fish out there after that, until the spring trout season, as I had already decided a few years back not to bother the last, later winter, wild Olympic Peninsula steelhead. We shouldn't be fishing for them any more. Ice on the beaches. We get many mild breaks in the winter weather, here in the Rainshadow of the Olympic Mountain range. And we have been successful at catching wild sea-run Coastal Cutthroat trout here during these warmer breaks all winter. So I just might be sticking closer to home this weekend, avoiding the river crowds, and plying the saltchuck with some new Cutthroat flies I have been working on. With this warmer forecast for the few days or week or so ahead of us, I bet there's going to be some nice fish cruising the beaches. I will likely dust off the dory and get out for a row. But then again, gas is cheap right now . . .
Oh, and then, there's a few lakes open here all winter . . . Gratitude. I don't know where to begin, as I count my blessings. Most of all I am grateful for my many friends, and for the beauty of the wilderness life, wild fish and bright waters that we share in common. I am blessed beyond measure. I think we all are, most of the time. It pays to reflect on that. Give me a yell if you want to come fishing this winter. Happy Thanksgiving! 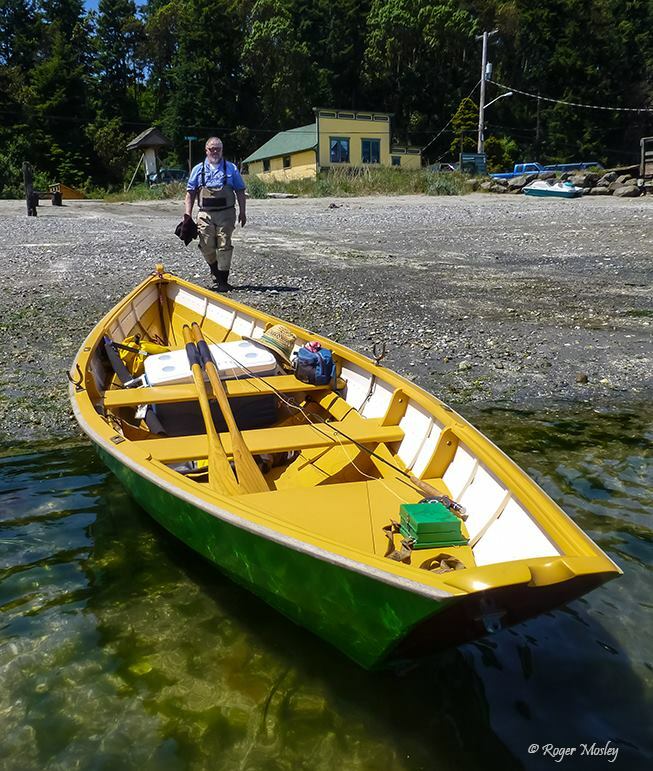 I am guiding fly fishers on the Olympic Peninsula beaches, rivers and streams. We walk and wade, fly fishing for sea-run Coastal Cutthroat trout in freshwater and saltwater, and in the rivers for Cutthroat trout and summer steelhead. And we fish for Pacific salmon on the beaches. This is all strictly catch and release, traditional, barbless single hook, fly fishing only. Lunch, snacks, soft beverages, and use of some equipment is included. I also offer personalized and private fly fishing and fly casting instruction for beginners through advanced casters. I would be happy to help you plan your Olympic Peninsula fly fishing adventure, for all levels of ability. Public presentations, Naturalist Guide, rowboat picnics, tide pool and river trail day trips. Please call, write or email for booking details. Now booking for April through October, and beyond.